Maiko-Han Japanese Cosmetics now in Sasa Singapore! When we think of Geisha, it'll automatically remind us of porcelain skin, flawless and fair complexion, defined winged eyeliner and so on. Don't you agree with me? Have you then ever wonder what makeup items do these professional performers use to stay so flawless throughout their performance? Today, I'll be exploring the brand Maikohan for the very first time, reviewing products that are commonly used by Geisha and ladies who like to have natural porcelain skin. 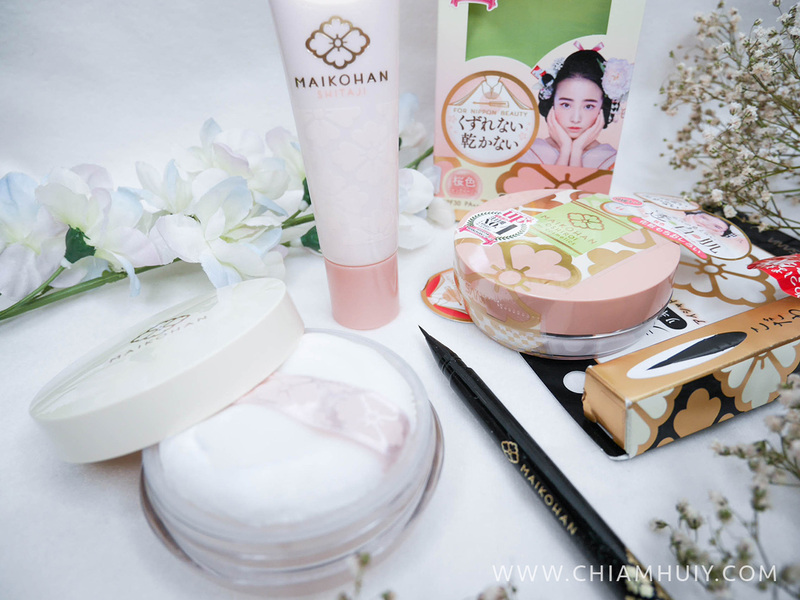 Here's the quick overview of the items I'll be reviewing today - SANA Maiko-Han Base NA Sheer Pink, SANA Maiko-Han Face Powder and SANA Maiko-Han Intense Black Liquid Eyeliner. Intense dark eyeliner, pink eyeshadow and porcelain smooth skin. 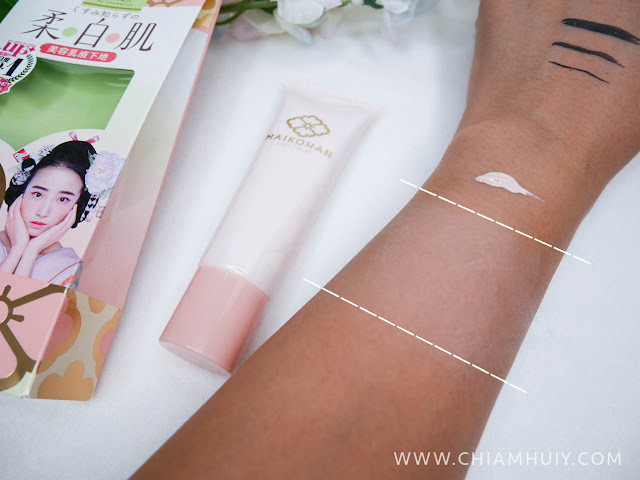 To prep my skin for a porcelain look, I'll start off by evening out the complexion and dull skin with SANA Maiko-Han Base NA Sheer Pink ($24.90). This makeup base can easily brighten up your skin so that your face don't look dull and tired. 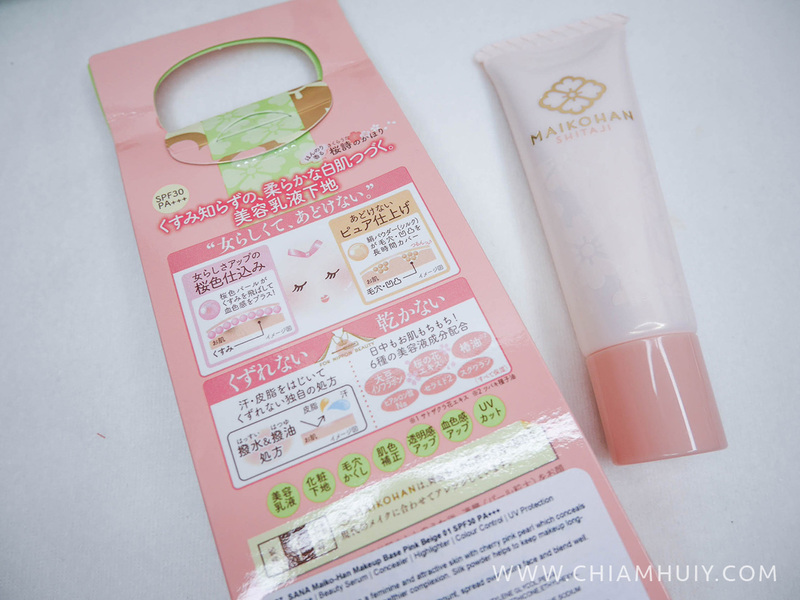 As you can see, the Maiko-Han Base NA Sheer Pink does brighten up my skin despite me being very tan. Once you have the base done, it's time to powder it up! 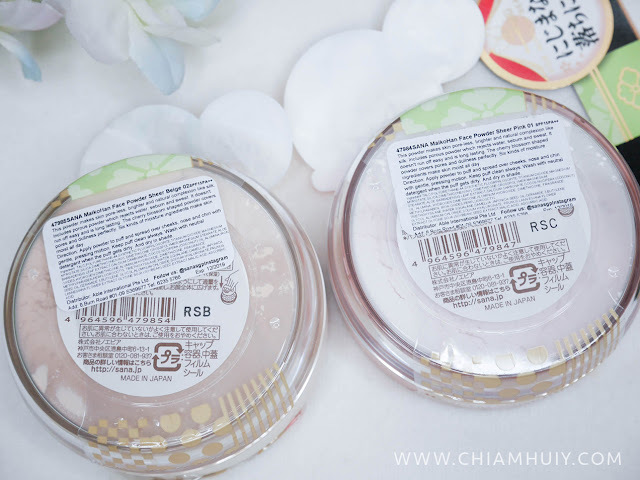 Here I have the SANA Maiko-Han Face Powder ($29.90) in two shades - Sheer Pink and Sheer Beige. Notice the word "sheer" in both names. I reckon it's because this face powder is really all about sheer and minimal coverage, probably just to mattify the face to give a smooth silky complexion. Apparently, the powder particles are said to be wrapped with serum containing coconut oil and aloe vera leaf essence, so it can keep your skin comfortable and moisturised. Also, did you notice that the opening of the face power uses a flexible netting instead of the typical holes we usually see on our face powder containers? 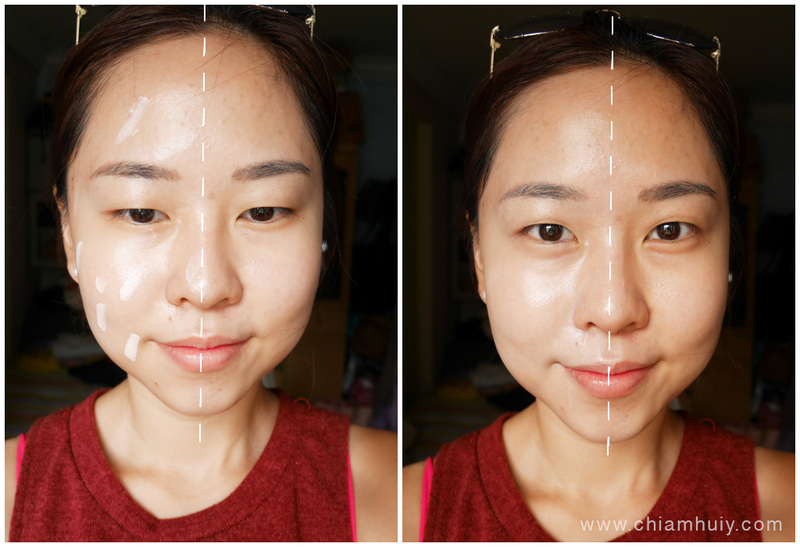 This ensures even application of the powder and not patchy dots on the face. People who who me know that I can't live without black eyeliners. Waterproof and smudge proof capabilities are definitely the aspects I look at. 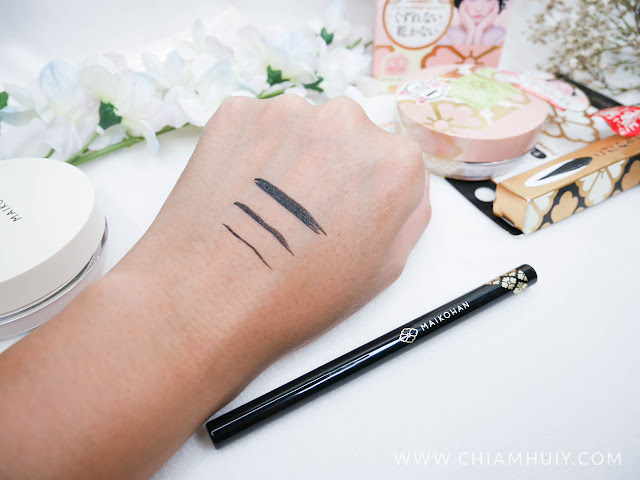 SANA Maiko-Han Intense Black Liquid Eyeliner (S$23.90) are both smudge proof and waterproof, which is why it's great for those who like to have really distinct and defined eyeliner. Don't get me wrong. These eyeliner swatches are drawn using the same Maiko-Han Intense Black Liquid Eyeliner, just that on different angles. This eyeliner has a flat brush head so it can draw both a thin and thick eyeliner as you wish. As you can tell, the colour is also very intense and this was achieved by just one swipe. Oh, did I mention it dries really fast too!? Time to attain your porcelain doll look with Maiko-Han Japanese Cosmetic today! 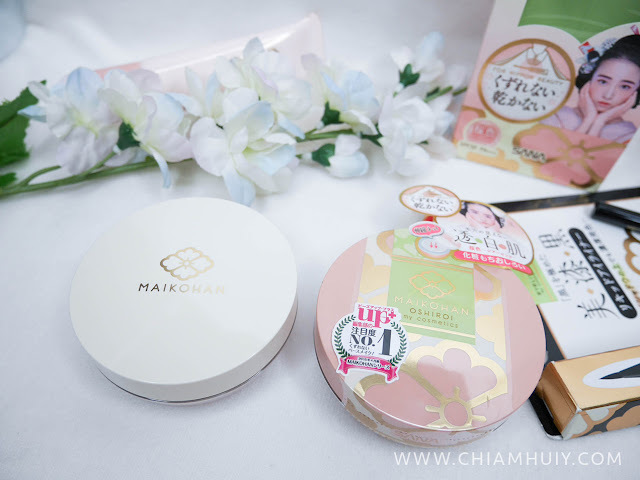 Maiko-Han Cosmetic can be found exclusively in all SASA Outlets.